What Does An Author Read? Welcome to Redwood’s Ramblings. This blog will be much different than Redwood’s Medical Edge. RME is devoted to helping contemporary and historical novelists write medically accurate fiction. I post there Mon, Wed, Fri and Saturdays. Ramblings will be the jottings of an avid reader turned author. I’ll post here on Tuesdays. This will be the place to celebrate the craft of writing, the love of books, and everything in between. I want to know about you and your love of writing, reading (have I said I love books! ), and novels of all types. Please, I love comments. Blogging is no fun without a little interaction. Introduce yourself! I was actually surprised by a recent discussion at a marketing loop for authors where several writers lamented that they were running into people who thought they could write a book but weren’t avid readers. Personally, I akin this to a pastry chef swearing off chocolate. How can that be possible? My love of reading was the genesis of my love of writing. I wanted to write stories like the authors I fell in love with. Having complete control over a story world was an excellent choice for an organized, stable personality (okay, slightly manic OCD type) like myself. In my youth, I remember the first book I absolutely could not put down was V.C. Andrews Flowers in the Attic series. I am probably dating myself here but does anyone else remember these books? Is that author still alive? Who is actively looking up the publishing date to see if they can find out how old I am? Since then, my tastes have changed, though I still am an avid reader. I want to know, who are some of your favorite authors and why? I’ll name a few here. Dean Koontz: If anyone ever says I write like Dean Koontz, I will drop tackle them and smother them with kisses (so hopefully this won’t be someone who will be offended by my exuberance.) Dean has been a long time favorite. I love his use of prose and I dream of having his descriptive authority. If you haven’t read Sir Koontz try Intensity and Life Expectancy. Two of my absolute favs. Harlan Coben: Only recently did I discover Harlan and his books and quickly devoured several in his backlog. Caught was my first novel but my favorite so far is Tell No One. What I love about Coben are his plot twists and turns. He is a master at that. Here are a few of mine. What are some of your favorite authors and why? This entry was posted in For Aspiring Authors, For Fabulous Readers and tagged Dean Koontz, Harlan Coben, Redwood's Medical Edge, VC Andrews. Bookmark the permalink. 4 Responses to What Does An Author Read? Hi!! I can’t wait to read your book, Proof. It sounds very interesting. I love books with a medical theme. Cheryl Wyatt writes for Love Inspired and I love her books. She portrays God’s love and grace in such a way that I am encouraged and lifted up after each book I read. 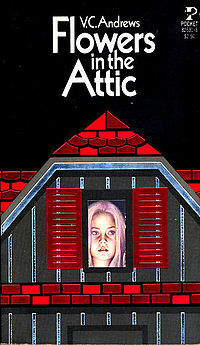 I grew up reading V C Andrews as well. Thinking back, what was my mother thinking??! I collected the whole series. I also grew up reading Louis L’Amour westerns. I loved the stories of the Old West. Charles West has a medical thriller that I loved reading and would love to read more like it. It is called, “The Tenant.” The storyline is about a brain transplant. It reminded me of that movie with the guy from Simon and Simon and Mare Winningham. Congratulations on getting your book published and I look forward to reading more of your work. Is there another book in the works? One, please forgive me for not responding sooner! Your comment slipped past me. Did you have a chance to read Proof? I’m curious to know what you think. In fact, if you like Cheryl Wyatt– I was very blessed to get an endorsement from her for Poison which is book #2 in the Bloodline Trilogy that releases in Feb 2013. The Charles West book sounds right up my ally for sure. Hmmm…. a brain transplant– if you liked that you should definitely read book #3 in my series– Peril. I’d be intrigued to hear what you think. I hope you see this comment and thanks so much for visiting. That led to a relationship between the two authors. Koontz dedicated his novel, The Husband — which is currently being made into a major motion picture — to Smith and his wife. I think some of your comment didn’t post possibly? I’d love to hear the whole thing as I am a HUGE Koontz fan.